Innovative Components manufactures Tank Level Indicators and Tank Gauges for many liquid level sensing and measurement applications. We offer precision electronic level sensors as well as mechanical indicators for applications that do not have power available. Our mechanical Liquid level tape measure (LLTM series) provides a full to empty tank reading in inches via a tape measure. The Level keeper indicator (LKI series) is a multi point system which displays full to empty readings via bright LED lights. We also have a Continuous Level Monitor (CLM series) which is designed for accurate continuous level indication with accurate readings every 1/4″ of level movement. The Ultrasonic Distance sensors are the most accurate and can be used in tanks up to 30 feet deep! For more detailed information on our Tank Level Indicators and Liquid Level Sensors click on the categories below. These liquid level indicators are fully mechanical and provide an exact measurement of how much liquid is in your tank. These units are ideal for portable storage tanks, hazardous locations, or remote areas where electricity is not available. They are offered in all stainless steel, stainless & buna, and polypropylene. To take a reading simply pull the tape measure out of the stem until you feel a magnetic lock up between the float and tape measure. These multi point tank level indicators are a great choice for storage tanks and totes. They provide bright, easy to read, full to empty LED indication. These versatile float level indicators are available in all stainless steel, stainless & buna, and polypropylene. Additional output relays can be added for high and low alarms or pump control. 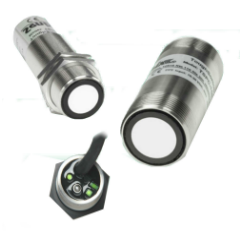 These vertical float type continuous level sensors are used in tanks and vessels that require precise liquid level indication. They are offered in all stainless steel, stainless & Buna, or polypropylene. The sensor is a 3 wire potentiometer that provides a change in resistance every ¼” of level movement. Use a digital panel meter to display the exact liquid level reading or signal conditioner which provides a standard 4-20mA output signal.